... where the money was spent on social security ($85BN), defense ($58BN), Medicare ($75BN), Interest on Debt ($33BN), and Other ($170BN). 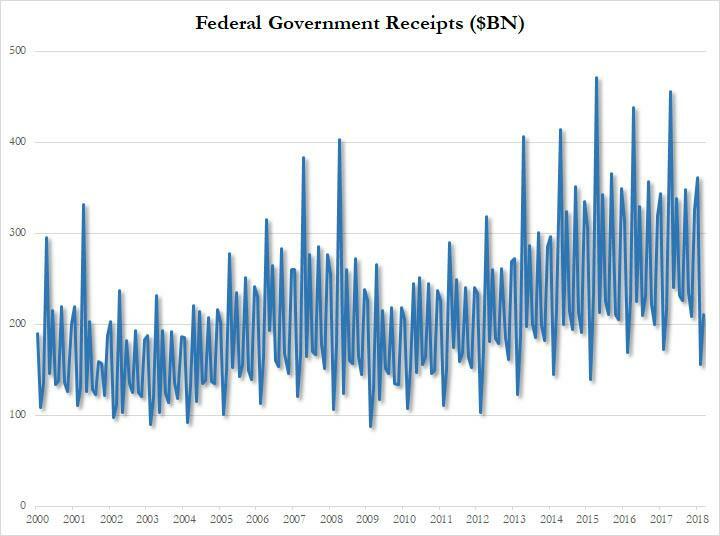 The resulting surge in spending led to a March budget deficit of $208.7 billion, far above the consensus estimate of $186BN, and over 18% higher than $176.2BN deficit recorded a year ago. 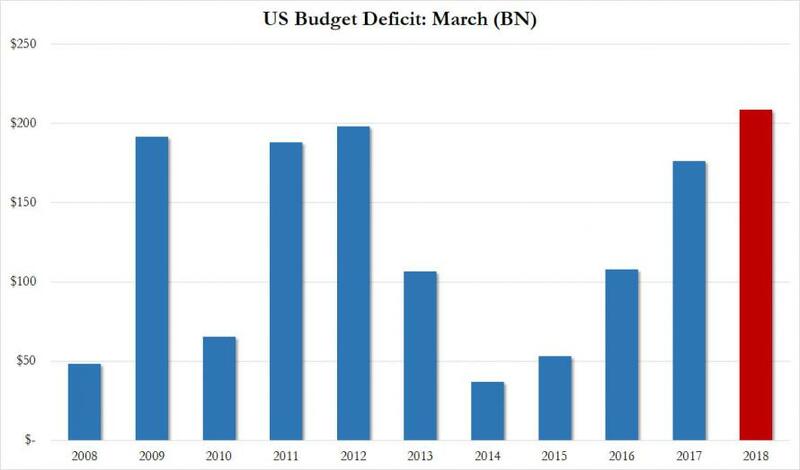 This was the biggest March budget deficit in US history. 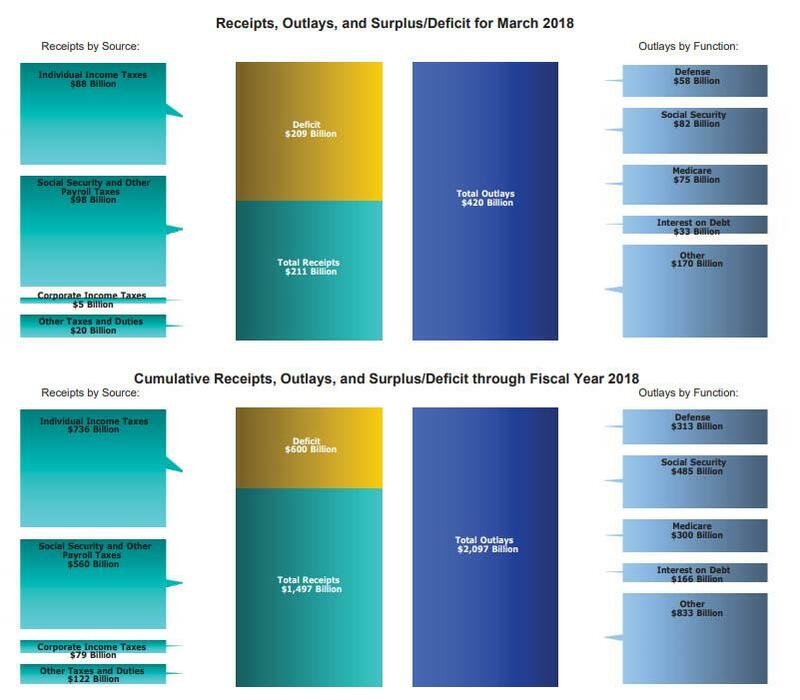 The March deficit brought the cumulative 2018F budget deficit to over $600bn during the first six month of the fiscal year, or roughly $100 billion per month; as a reminder the deficit is expect to rise further amid the tax and spending measures, and rise above $1 trillion, although at the current runrate it is expected to hit $1.2 trillion. As we showed In a recent report, CBO has also significantly raised its deficit projection over the 2018-2028 period. 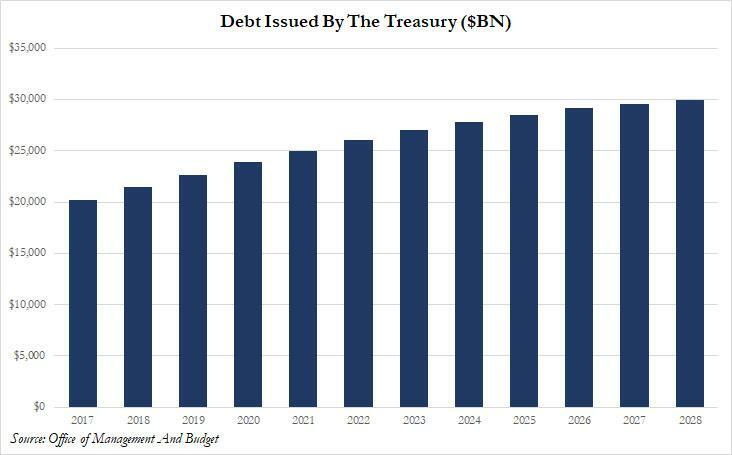 But while out of control government spending is clearly a concern, an even bigger problem is what happens to not only the US debt, which recently surpassed $21 trillion, but to the interest on that debt, in a time of rising interest rates. 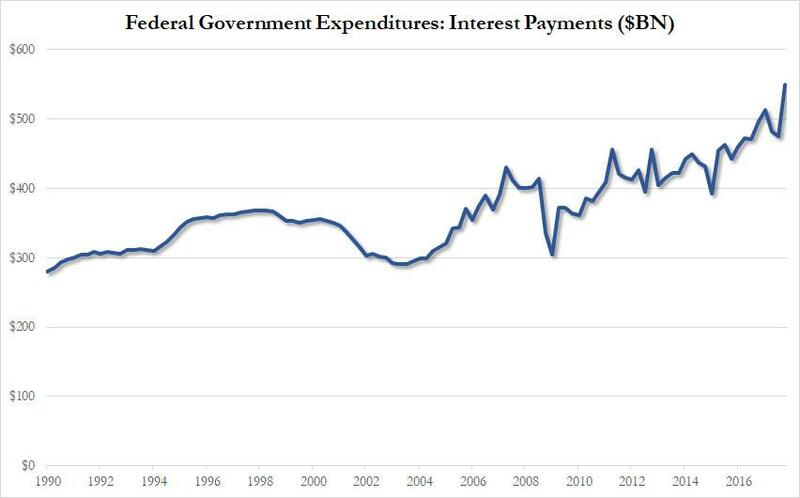 As the following chart shows, US government Interest Payments are already rising rapidly, and just hit an all time high in Q4 2017. That's when Fed Funds was still in the low 1%'s. What happens when it reaches 3% as the Fed's dot plot suggests it will? 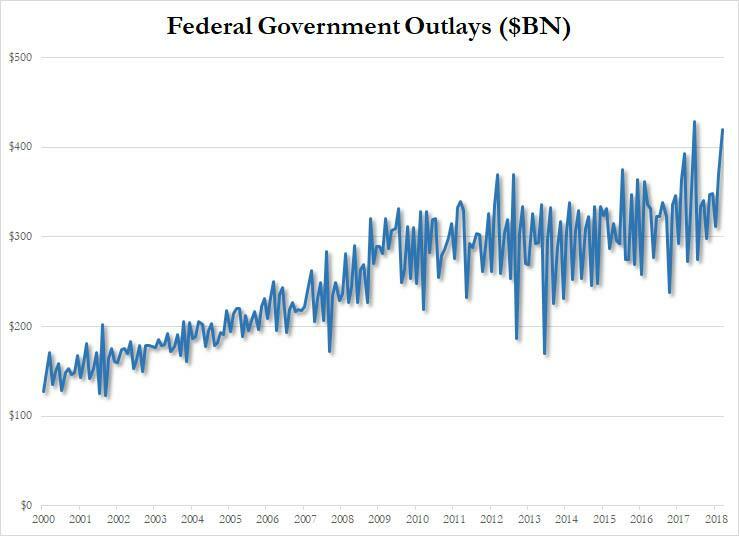 In a note released by Goldman after the blowout in the deficit was revealed, the bank once again revised its 2018 deficit forecast higher, and now expect the federal deficit to reach $825bn (4.1% of GDP) in FY2018 and to continue to rise, reaching $1050bn (5.0%) in FY2019, $1125bn (5.4%) in FY2020, and $1250bn (5.5%) in FY2021. 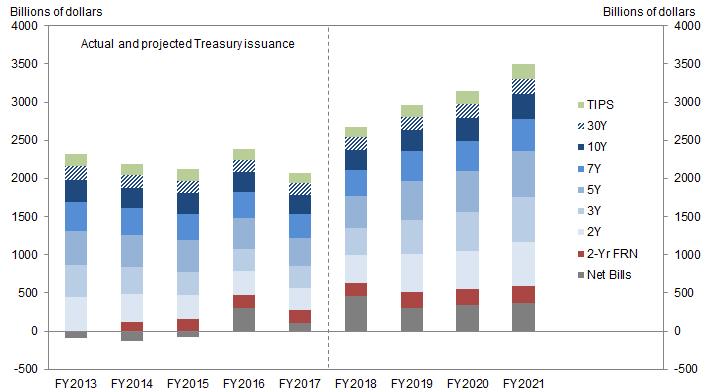 Goldman also notes that it expects that on its current financing schedule the Treasury still faces a financing gap of around $300bn in FY2019, rising to around $750bn by FY2021, and will thus need to raise auction sizes substantially over the next couple of years to accommodate higher deficits. The increase in Treasury issuance and the ongoing unwind of QE should put upward pressure on long-term interest rates. On issuance, the economic research literature suggests as a rule-of-thumb that a 1pp increase in the deficit/GDP ratio raises 10-year Treasury yields by 10-25bp. Multiplying the midpoint of this range by the roughly 1.5pp increase in the deficit due to the recent tax and spending bills implies a 25bp increase in the 10-year yield. On the Fed’s balance sheet reduction, our estimates suggest that about 40-45bp of upward pressure on the 10-year term premium remains. And here a problem emerges, because while Goldman claims that "the deficit path is known to markets, but academic research suggests these effects might not be fully priced immediately... the balance sheet normalization plan is known too, but portfolio balance effect models imply that its impact should be gradual" the bank also admits that "the precise timing of these effects is uncertain." What this means is that it is quite likely that Treasurys fail to slide until well after they should only to plunge orders of magnitude more than they are expected to, in the process launching the biggest VaR shock in world history, because as a reminder, as of mid-2016, a 1% increase in rates would result in a $2.1 trillion loss to government bond P&L. ... without launching a debt crisis in the process.